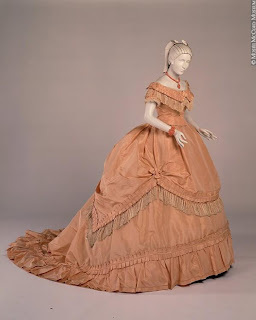 Today this peach colored ballgown from the McCord Museum in Canada is the dressgasm of the day. It came from Maison Soinard, Paris in approximately 1868-1869, which would be after the American Civil War. The ballgown is made of silk taffeta with fringe and tulle accents. It is lined in cotton and has bone and metal to keep the bodice stiff and shaped properly, in addition to the corset the woman would have worn underneath. Constructing this ballgown was done by both machine and hand sewing, which sometimes confuses people, but the sewing machine has been used since the 1850s. – A proper woman never exposed her shoulders or arms (with the exception of underage girls) before evening, no matter how hot the weather. – There were several styles of what is known as a “ballgown” based on the type of event. Dinner parties were a little more covered up but no less ornate. Balls dictated the classic “ballgown” that we all think of today. – Ballgowns were made of rich, shiny fabric and done in light colors for practicality. There was no electricity in the mid-nineteenth century, so nighttime parties were dimly lit even if there were a million candles. A shiny white dress (or any other pastel) picked up the light. Wouldn’t you want to be “seen” if you paid so much for your beautiful ballgown? – Color was determined by age and marital status. The lighter the color, the younger and more single you would have been. Once a woman married, her dresses took on darker colors. Single woman, as they advanced in age, progressed into darker colors as well. – Ballgowns and the women wearing them were very often decorated with fresh flowers or even false flowers, fruit, feathers and so on. A ball was a big deal and people wore the finest of everything they owned. >Ooh, keep posting ball gowns. I finally have an event to wear one to, and I need inspiration. It's not until 2015, so I've got time!